For the eighth day of our pink nail art Odyssey, we're giving you a DIY pearl manicure using essie cosmetics. Aside from raising awareness for a cause very near and dear to our hearts, we're giving something extra to you, dear readers. We're awarding the essie BCA collection to a reader who comes up with the most clever name for today's manicure. How to enter: Tell us what you'd name today's manicure in the comments section or Tweet us at @BeautyBlitz. This 3-D pearl manicure reminds us of champagne bubbles fizzing across our fingertips. Champagne is a great celebratory treat, and we're celebrating BCA month with some bubbly nails. Below, we show you how to create it at home. 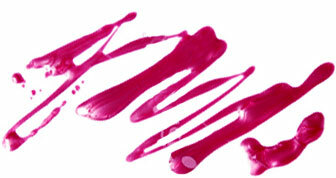 - A medium-color pink polish. We used essie polish in I Am Strong from the new BCA collection. - Self-adhesive faux pearls from a crafts store. We used different-sized, white pearls and pink pearls. Step 1: Paint your nails with two coats of pink polish. Step 2: Apply topcoat. We recommend doing step 2 and 3 for one nail at a time so the topcoat stays wet and the pearls stay in place. Step 3: Use a tweezer to apply pearls to the nail. We applied ours in a swirl pattern to give the effect of fizz. Use different sizes and colors - the design is up to you! Step 4: Kick back, sip some real bubbly and enjoy your effervescent nail art!